How creative office spaces can help improve workplace productivity and wellbeing. Step inside Currencycloud’s Spitalfields-based office in the heart of London’s East End and you’ll be welcomed by a workforce of dynamic, switched-on and motivated individuals. Guided through the space by colourful, curvaceous walkways, you’ll come across an old-school-style Bleacher presentation area, a relaxed Barista café featuring oversized reclaimed tables, an eclectic mixture of seating styles and a sociable bar area where employees can enjoy some down time. 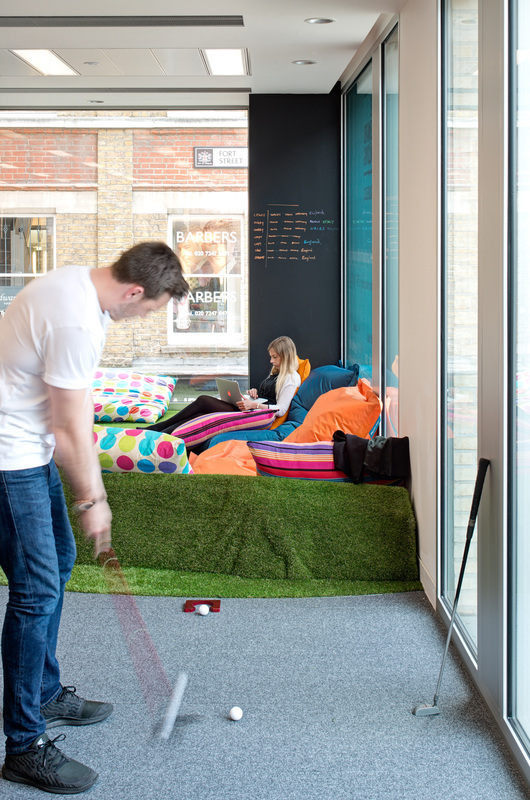 This leisure space continues on to lounge-style sofas, hanging hammock chairs, a video games area and the star of the show: an artificial grass-covered pitch’n’putt area. Now, you’d be forgiven for thinking this is the workplace of a hipster-esque advertising agency or convention-rebuffing gaming company, but Currencycloud is actually part of the financial sector…FinTech to be exact. Gone are the days where corporate office spaces are required to reflect a sombre and serious mood; segregational management rooms, linear desks and an overriding lack of colour are being substituted for collaborative meeting spaces, hot-desk work areas and bold, invigorating palettes. 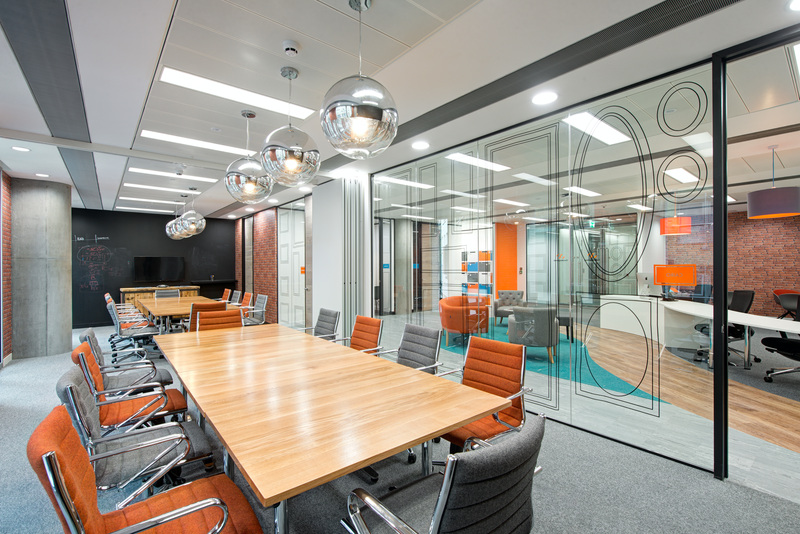 Employers are getting to grips with the internal dynamics of their business / workforce relationship, taking time to consider their office interiors and how they affect the day-to-day workings of the company. A visually-engaging and interactive workplace equates to a happy team, and a happy team means increased productivity, improved creativity and an all-round great place to work – clients will want you to work for them, and prospective employees will want to work for you. It is a studied principal that tackling disengaged workers lies in good office design. One study in particular found that a happy employee is up to 20% more productive than an unhappy employee. 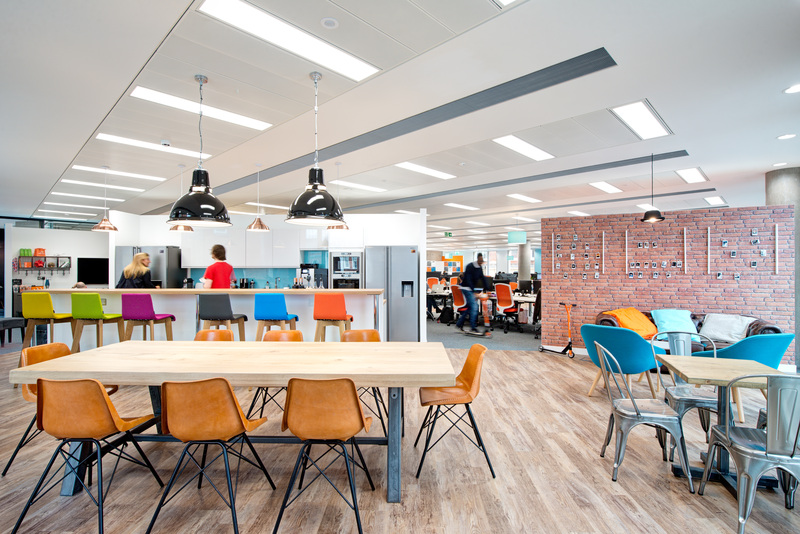 But why does workplace design make staff happier, we hear you say? Company culture is as important as the service and / or product it provides, and outside of a good salary and job satisfaction, brand identity is up there with many jobseekers’ top priorities when it comes to choosing a place of work. Brand identity is represented through a variety of mediums, but it has its roots in office design. As a hub for any company’s activity, the office is representative of the brand ethos, dynamics and aspirations, and through creative and clever interior design, can serve to inspire and drive the internal workforce and its core objectives. This is not only achieved through the aesthetics of a company HQ, but how the physical space is designed to cater to individual needs and work styles. For example, creating ‘focus’ areas for introverted workers, away from the hustle of an open-plan office, can work wonders to get optimum performance from this particular worker style, and ‘down-time’ social spaces that encourage reflection and respite can serve to create a more positive and interactive team dynamic. The concept of the ‘hot-desk’ is also an interesting design movement for a happier office space. A 2018 poll by Capital One identified that 30 percent of workers would like a more collaborative space, and a huge 80 percent stated that they feel more productive when able to move around, it is hard to deny the fact that office design makes a huge difference. On the flip side, it’s not about lavishly expensive office overhauls with the latest must-have tech and over-indulgent, budget-busting fittings; it’s about getting creative with the space and identifying your company objectives. Simple changes such as introducing leisure areas, or opening up closed-off cubicles will have an instant effect on employee happiness and productivity. Light, colour and texture are also essential elements to consider when re-designing an office environment that encourages a more positive and inspirational outlook. The concept of Biophilia suggests that humans possess an innate tendency to seek connections with nature and other forms of life. Spending up to nine hours a day in an office, especially one that is lacking in natural light and access to outdoor space, can lead to a significant dip in workplace morale and personal happiness. Introducing design elements that encourage a connection to nature is proven to increase workplace productivity by 15%. This includes plant life, studies of which have shown that introducing natural greenery into the workplace boosts cognitive behaviour and improves overall health. 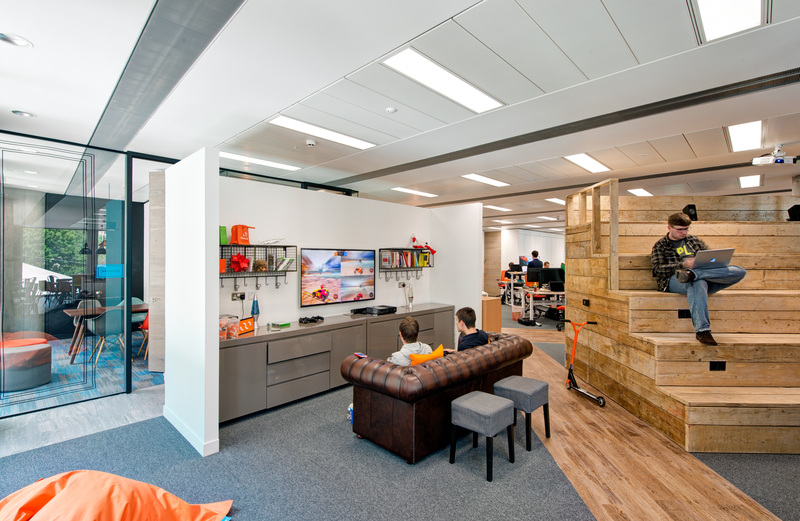 So, whether you’re a tech-savvy financial company, über-cool gaming brand or creative marketing agency, office design is about understanding your people and their work-based needs. After all, it’s these individuals that make your business a success!